Since Satoshi Nakamoto first published his research on the chain linkage system under which bitcoin operates in 2008, news about blockchain technology has become a frequently discussed topic, not only because of the rise of new cryptocurrencies or the interest of large companies that are working in the financial sector, telecommunications or insurers, but rather for the multitude of possibilities that it introduces to the social, public or development cooperation. 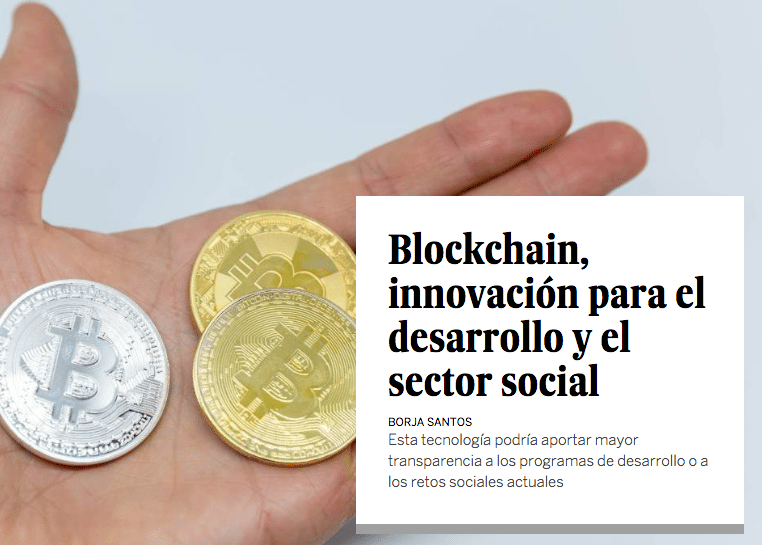 On the 24th of January, at the BBVA Open Space in Madrid, the company COMGO, together with organisations such as itwillbe, Cáritas, IBM, the Botín Foundation or the Spanish Association of Foundations showed a series of prototypes that implement blockchain technology. With it, such companies are aiming to provide increased transparency and participation in their processes in development programs or in current social challenges in the Spanish panorama.This was yet another example on a long list of possible applications of such technology. UNICEF, for one, has opened a call for blockchain start-ups that are oriented towards vulnerable children. Another example is a pilot conducted by the United Nations World Food Program, where the organization provided refugees in Jordan with food vouchers which they could then trade at selected markets. The platform successfully recoded and authenticated transfers for about 10,500 individuals. Blockchain is a distributed database that works as a large registry tailored for recording transactions and data that is stored securely without a mediator. The technology allows to keep a copy of the data and details of both sides of the transaction so that the blocks of each operation are linked together with a form of security that can neither be deleted nor modified. In any system where a form of exchange exists, blockchain technology can improve its transparency and traceability. It then naturally follows that this technology could have a transformative impact on sectors such as development cooperation, the collaborative economy, public administration, and -if utilized innovatively- in the Spanish context. Jamie Berrocal, IBM expert in blockchain states that “The relationships between people or entities in these platforms have an increased reliability between the parties involved. Intermediaries are avoided and collaborations once unthinkable are generated.” Paul Lamb compares it with the impact he had back in the day on the internet, but while with the internet information is shared, with blockchain, value is exchanged. One of the experimental pilot projects was presented by the NGO itwillbe, in which they developed an internal system where they can immediately audit any transaction your organization makes to their projects in India. For security purposes, only involved parties can have access to who sends and receives the money. In that, encryption is yet another one of its characteristics. “All participants, donors or beneficiaries, are identified and can validate their transactions. This makes it possible to guarantee that the money reaches those for whom it is destined.” explains Arancha Martínez, founder of the organization. This new level of transparency could potentially become especially important for the sector where, according to the former United Nations Secretary Ban Ki-moon, 30% of aid did not reach its destination due to corruption or due to problems of accountability or transparency. “For us, it’s a display of confidence that everyone involved in the project has the same information. In this way, people can also participate in the impact made,” said Natalie Peiro, general secretary of Caritas Spain. Traceability also allows for numerous other applications. Amongst those presented in Madrid was blockchain’s applications in the food sector where it is hoping to improve the supervision of the food chain. Also, the pharmaceutical sector is looking to utilize it to improve vigilance in the production and distribution of medicine. Another interesting project is that of Cortex, which aims to help individuals maintain their academic backgrounds. The project was inspired by refugees, who are often forced to leave their certificates once they flee. The solution for Cortex was to shift the paradigm from a system based on papers to one that is based on a universal database that demonstrates the academics of individuals at all times and places. Many of these projects are still new and are maturing in a market that still needs more regulation and development. For Manuel Hurtado, co-founder of COMGO and former student of MIT-Fintech, these pilots experiences will multiply their impact once they converge with other high-growth technologies, such as Artificial Intelligence, the Internet of things or big data. These innovative initiatives have been developed with the collaboration of NGOs, private companies and other organizations or foundations. They could become yet another example of the so-called virtuous cycle. However, one of the key questions is if the public administration has the capacity to ensure that it is keeping up with new advances in social innovation. We know that many readers will think that before the application of such technology takes place, a change of cultural and institutional paradigm would be necessary. However, an open, innovative and transformative way of thinking is the only prerequisite for such a shift in transparency, data traceability and improvements in public management. Hopefully, with this premise, blockchain is the technology that not only opens the doors for a new form of currency, but rather also of improvements in administrative processes, in international development programs and in our social economy.